THE LEFT BUCKLES TO THE WILL OF THE PEOPLE … FRANKEN TOSSES GRIFFIN TO THE CURB. It would appear that Sen. Al Franken (D-MN) is all talk, as he has flip-flopped and canceled even with disgraced uber-Left comedian Kathy Griffin. The big-mouthed Democratic senator had said on Wednesday that he would still hold an event with Griffin on July 7 in California after she was fired by CNN for her disgraceful and vile photo shoot with a beheaded, bloody mask of President Donald Trump. It would appear the out-of-touch Democrat senator got an earful from his Minnesota constituents. Actions have consequences and Griffin is about to get a life lesson in that what goes around comes around. Can you imagine that individuals actually find the below picture offensive? Sen. Al Franken has reversed himself and decided “it would be best” for Kathy Griffin not to attend an event that the Minnesota senator had scheduled with the comedian for July. The Democratic senator had said on Wednesday that he would still hold an event with Griffin on July 7 in California, even after publicly distancing himself from an image showing Griffin with a faux beheaded President Donald Trump. Believe it or not, we can see that Kathy Griffin was hardly sorry in were crocodile tear apology. As per The Daily Caller, Griffin is holding a press conference to whine about the “bullying from the Trump family that she has endured.” WOW, she was bullied? Actions have consequences and you can say adios to your career. Moonbat Comedian Kathy Griffin Beheads President Trump in Photo Shoot … This is Humor? SO SOME ONE IS GOING TO HAVE TO TELL ME HOW THIS IS HUMOR … TAKING DEMOCRAT BLOOD LUST FOR TRUMP TO A NEW LOW. 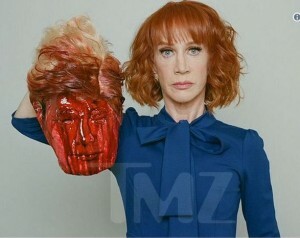 From TMZ comes the following hideous story where uber-lib comedian Kathy Griffin did a photo shoot with a mask of President Donald Trump’s head, severed and detached from his body. ARE YOU FRIGGING KIDDING ME!!! This is supposed to be humor? Good luck discussing that with the Secret Service. If I didn’t know better, this looks similar to ISIS videos, doesn’t it? As one of the better tweets from Twitchy apply opined, “When they go low, we go ISIS video.” Welcome to the moonbat Left and what is driving it. Talk about a double standard and hypocrisy. Can you imagine if anyone did this to former President Barack Obama? They would lose their job and be hounded into hiding. According to the poll at TMZ, 23% of individuals actually think this is fair game. Welcome to today’s Democrat party. But of course it would be different if Trump’s head was replaced with Obama’s. THIS IS JUST NOT FUNNY, ITS OFFENSIVE! UPDATE I: Kathy Griffin makes lame apology after her hideous photo shoot … ‘I beg for your forgiveness’. Apology not accepted. You knew damn well what you were doing as seen in the TMZ video. This fool should get the same treatment as the rodeo clown. Screw you and your apology. You now need to lose your job and your endorsements. You made your bed. CNN needs to cut ties with her now and do so vocally. An apologetic Kathy Griffin took to Instagram to issue a mea culpa for participating in a photo shoot that featured her holding up a bloody head resembling President Donald Trump. UPDATE II: President Trump Calls Out Kathy Griffin On Twitter: ‘Should Be Ashamed’. As I have always said, humor is truly funny when there is truth to it. As Kimmel opined, hard to call it a conspiracy theory when it actually happens. He went on to joke that “maybe Hillary Clinton had a few too many shots of Trump Vodka the night before.” Folks, the slurred speech is not alcohol, its when she is over-medicated for what ever the neurological disorder is that she is keeping from the American people. As reported by William Teach at RWN, the American people are not buying Hillary’s latest lie of pneumonia. JIMMY KIMMEL: Hillary Clinton was supposed to be in California today… but she had to cancel the trip because of illness. You probably know Hillary was coughing a lot in public last week and then yesterday she was forced to leave a 9/11 memorial because she was feeling faint. Turns out on Friday Clinton’s doctor had diagnosed her with pneumonia but they kept it secret until this happened and they were forced to admit it. You know, these conspiracy theories about Hillary Clinton’s health would be a lot harder to believe if they didn’t actually come true. Or maybe, just maybe, there’s another story here. Let’s run the video where she had to be helped into the van. You probably saw this on the news… We see she’s being kind of supported by one of her handlers there. And then she stumbles a little bit and then Secret Service has to kind of put her into the van.They even get between her and the news cameras. But I tell you, maybe Hillary Clinton doesn’t have pneumonia, maybe Hillary Clinton had a few too many shots of Trump Vodka the night before. It is kind of funny that the people who don’t think Hillary Clinton is fit and healthy enough to be president are so worried that Hillary Clinton is fit and healthy enough to be president. 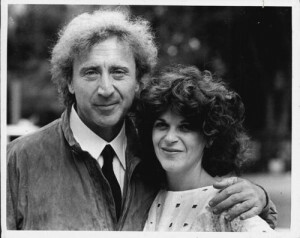 WHAT A SAD, SAD DAY THAT WE HAVE LOST ONE OF OUR COMEDIC ICONS … YOUNG FRANKENSTEIN IS THE BEST COMEDY MOVIE EVER!!! New York Times Obit: Gene Wilder Dies at 83; Star of ‘Willy Wonka’ and ‘Young Frankenstein’.